Soccer is immensely popular on Long Island. With millions of fans and players across the globe, soccer is the single most popular sport on Earth. Its roots can be traced back for centuries, with the earliest forms of the modern sport springing from a mid-19th century effort in England to standardize the many varying forms of football being played at the time. The rules that developed from this effort caught on quickly, and before long a uniform game of soccer began spreading through Europe and across the world. Soccer is a team sport played between two teams of 11 players competing to keep the ball away from one another and kick it into the opposing team's net. The only player on the field who can touch the ball with his or her hands is the goalie (with the exception of throw-ins, but those only occur after penalties or when the ball as been kicked out of bounds). The rules of the game don't require any specialized players beyond the goalkeeper, but several positions have evolved over the centuries. Strikers focus primarily on offense, defenders focus mostly on defense, and midfielders bridge the gap between the two while getting involved on both sides of the field. Today, there are many soccer leagues in every region of the globe. Long Island is no exception, with junior organizations, competitive school leagues, large soccer fields and public parks accessible to residents, amateur and friendly leagues, and even its own professional team, the New York Cosmos. Whether you’re looking to get out on the field yourself or want to sit back and enjoy and expertly played competitive game, Long Island has plenty of ways to enjoy the beautiful game. The New York Cosmos played their first season of professional soccer in 1971, going on to win five Soccer Bowl trophies as they played in the North American Soccer League for fourteen years. Their success went hand in hand with some of the biggest stars in world soccer, bringing the likes of Pelé, Giorgio Chinaglia, Franz Beckenbauer, and Carlos Alberto to the US. The NASL suspended operation in 1984 and for nearly 30 years the Cosmos were absent from professional soccer, but on August 3, 2013 the team made its triumphant return to the new North American Soccer League before a sellout crowd at Hofstra University’s Shuart Stadium. The Cosmos went on to win the 2013 Soccer Bowl with a 1-0 victory over the Atlanta Silverbacks, adding a sixth NASL championship to their storied name. With renewed success and an ever passionate fanbase, the New York Cosmos have submitted a proposal to the State of New York to build a 25,000-seat soccer stadium at Belmont Park. Soccer is the most popular sport in the world, and Long Island has its fair share of enthusiasts. In addition to the many soccer fans here, there are also plenty of young soccer players. For athletes and teams looking to improve their skills, the large facility at Pro Game Athletics is the perfect place to train, practice, and learn from expert coaches. Pro Game Athletics has partnered up with Red Bull Soccer for all their soccer training. They offer supplemental training throughout the winter season for age groups born from 2005 to 2008. No matter your skill level, a friendly game can be a ton of fun. Photo Courtesy of The Soccer Team. The Soccer Team is a recreational adult coed soccer club that hosts soccer games all over Long Island, in both Nassau and Suffolk county. Everyone is welcome to join, from beginners to advanced players. 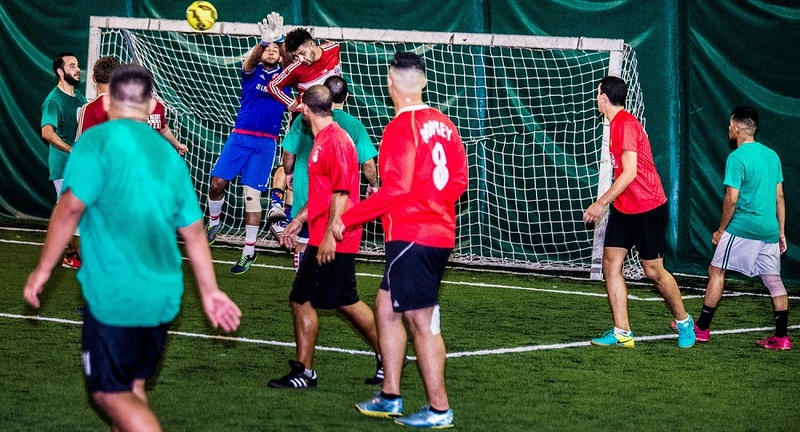 The Soccer Team organizes pickup soccer games, seasonal leagues, tournaments, family soccer and interstate recreational travel leagues (which go to Connecticut and New Jersey). The Team has been organizing games since 2012 and was born and raised on Long Island. The club will help you stay active, improve your stamina, make friends and have fun. Everyone who joins gets a free club t-shirt. A summer coed soccer league is coming soon. For more information go to, please visit their webiste. 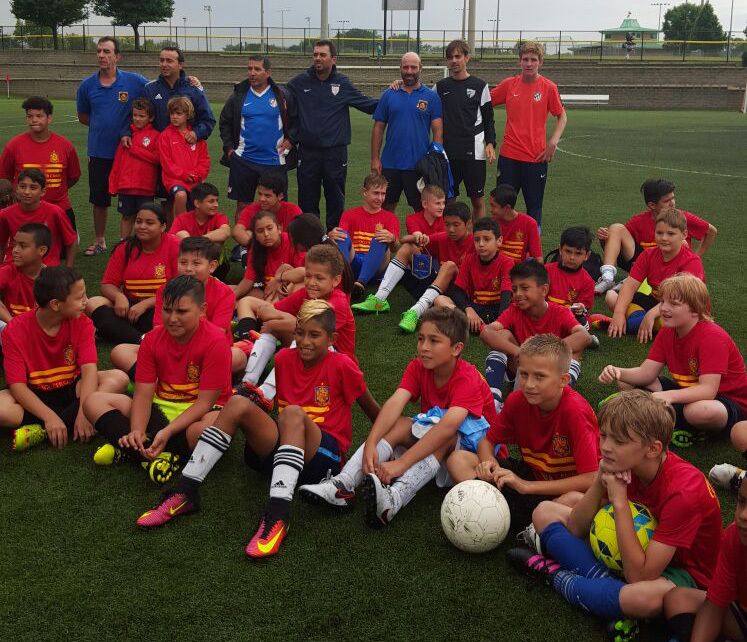 La Liga Soccer Camps will run June 12-16 at Tanner Park. Professional coaches from Spain’s La Liga will train girls and boys from age 8-18, helping them Improve skills, develop a soccer mind, gain training habits and apply all that they have learned in games. Players receive an evaluation plus a shirt! Register now, and remember that there are Team/Sibling discounts. Soccer Long Island Magazine is a multimedia publication with one objective - to bring Long Islanders the best soccer coverage locally and abroad. Soccer has always been a part of life on Long Island, a staple of our local sports culture. Soccer Long Island Magazine strives to bring you the hottest stories, news and updates about everything soccer - from the big stories about the MLS, to the scoop on the best places on the Island for kids to kick a ball around. As the only soccer publication for Long Island, we welcome you to share your pictures, videos and stories with us - in print and online! Founded in 2012 the Cross Island Crew is a New York Cosmos supporters group whose focus has primarily been to reach out to soccer fans on Long Island. Since their existence, they have worked passionately to grow the fan base for the Cosmos and work with the other supporters groups that are part of the "Five Points" supporters section at Cosmos matches. Whether it’s cheering for 90 minutes during matches, coming together for viewing parties, working on Cross Island Crew projects, or just helping the Cosmos with community outreach, being a part of the Cross Island Crew will always be an enjoyable and rewarding experience. Come join the Cross Island Crew and find out - they welcome one and all! Contact the Cross Island Crew via email, Twitter, or Facebook. There's nothing like a great save to rally the team. Photo Courtesy of The Soccer Team. This league has been organizing youth and adult futsal(soccer) leagues for over ten years on Long Island. Futsal® is the only "Official form of Indoor Soccer" approved by FIFA and is played on all the continents of the world in over 100 countries by more than 12 million players. Futsal is played on a basketball-size court using a special low bounce ball and can be played on a variety of surfaces. The game does not require the use of expensive dasher board - walls, as do other versions of indoor soccer. Without the walls, futsal is a great skill developer, demanding quick reflexes, fast thinking and pinpoint passing. It is an exciting game for children as well as adults. League registration begins in June for both youth and adult leagues, male, female and co-ed teams. 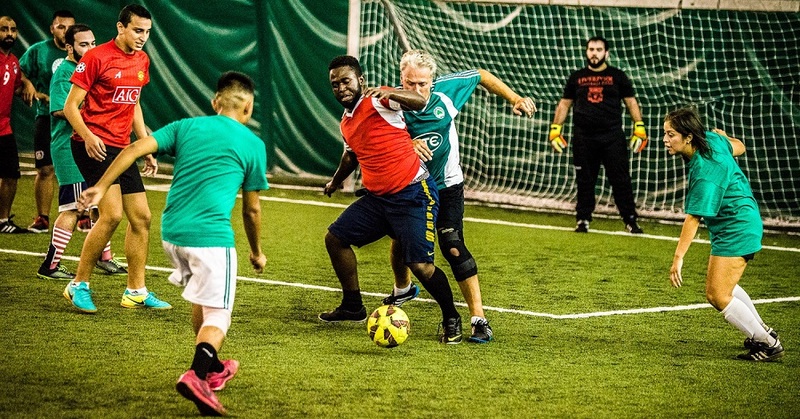 Indoor soccer for adult teams 18 and over. Indivdual registrations accepted. Teams play at indoor sports facility in Hauppauge, New York. Long Island Junior Soccer League (LIJSL) is one of the largest youth soccer leagues in the United States. The mission of LIJSL is to foster the growth and development of youth through the sport of soccer. Looking for all the latest Sports News? Visit our Long Island Sports News Section!